This is going to create a kerfuffle with traditionalists. The building is contemporary and modern but still had "traditional marae elements." "All the elements of a wharenui are there, they are just expressed differently. There hasn't been a marae out here since the eruption so we want to make this project really dynamic and symbolic of rebirth and moving into the future." You don’t have to be a traditionalist to build in traditions. Architect Louis Sullivan used to say that good architecture should always follow nature’s rule, that form follows function. His student, Frank Lloyd Wright, talked about “the deeper truth” that form and function are one --- that, in architecture for man, architectural forms will suggest and embrace functions. It’s about building in rituals. In the modern era of steel, glass, concrete and solar panels, building in traditional rituals in modern form – in a spirit embracing the future – well, what could be more appropriate. Architect Fred Stevens understands this. And let’s be honest. It s**ts all over the shed that Jasmax did for Tuhoe. This is very exciting. It retains the characteristic marae elements and even without the carvings, tukutuku etc. it's clearly a marae. It's great to see people interpreting established traditions in new ways. The Jasmax building reminds me of a 19th century theatre: a box with a decorative facade. 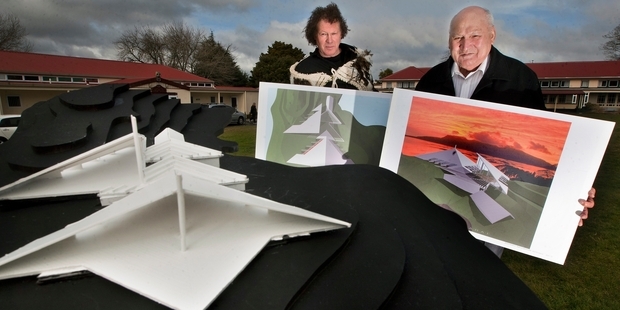 The plans for the Tarawera marae, however, are interesting from every angle. It's a building that will function as part of a landscape, whereas the Jasmax building looks more like an urban building that's only meant to be seen from the front.